To access the feature you need to click the down arrow in the top left corner, then click the 'doppler' to be taken to the Spotify Labs screen. From here you will be able to access 'Fan Spotter'. 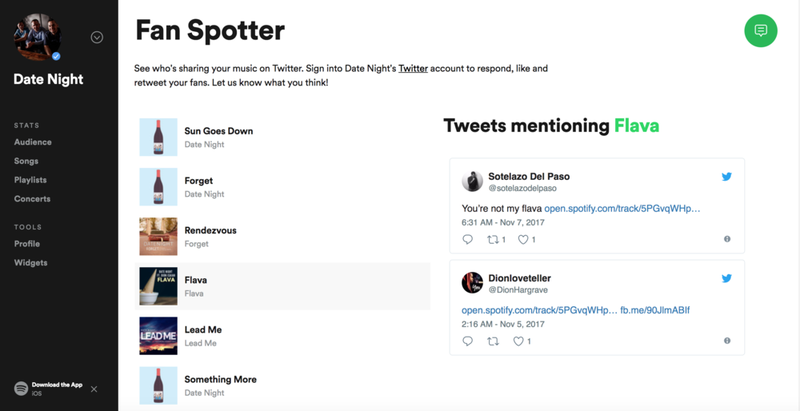 This shows you any tweets in which someone has shared your Spotify song link. This is particularly useful for tweets where a song is shared but the artist is not tagged (thus not notified of the share). Kudos to Spotify for offering yet another way for artists to connect with their fans.